By Christopher Pocock. Atglen, PA: Schiffer Military History, 2000. 288 pages. Chris Pocock has done his homework well. His most recent book — The U-2 Spyplane, Toward the Unknown, A New History of the Early Years — is the most comprehensive examination to date of the design, production, and deployment of the U-2 reconnaissance aircraft. 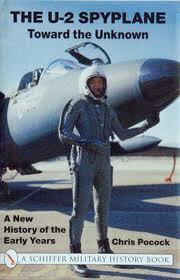 Drawing on freshly declassified materials and a wealth of interviews, Pocock traces the development of the high altitude spyplane from the early 1950s, a time of heightened concern over major gaps in US intelligence on the Soviet Union, to the shootdown of Francis Gary Powers and the Cold War tensions in the 1960s. The story of "Angel"—as Kelly Johnson, the brilliant Lockheed aeronautical engineer, called the U-2—is a fascinating tale of success, and Pocock knows his subject. He provides wonderful technical details on the plane's capabilities. The U-2 could fly at 70,000 feet, had a range of 3,500 nautical miles, and could stay in the air for 8 1/2 hours. The early J57 engine was the first jet engine with 10,000-lbs. of thrust; at 70,000 feet, only 7 percent of the engine's sea level thrust could be reproduced. In flight, there was less than a ten knot difference between a speed so fast that it would rip the wings off the aircraft and a speed so slow that it would stall the engine. Every plane, according to Pocock, was carefully crafted and had its own identity. Since each plane was different, repair parts had to be specially marked. The U-2 could "manufacture" fuel: its kerosene fuel mixture was "cold-soaked" in the wing tanks, and when the fuel heated and expanded as it passed through the fuel-oil exchanger, it actually produced 20 to 30 more gallons of useable fuel. Without a fuel gage, U-2 pilots were often astonished to find that they had more fuel left than what they had carefully calculated. Pocock does not neglect the historical setting for the development of the U-2, nor the political infighting that accompanied it. He carefully lays out the role that civilian scientists—such as James Killian, "Din" Land, and James Baker—played in advocating the development..